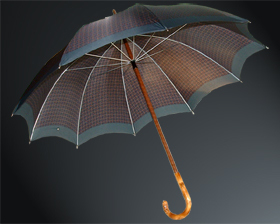 Mora-Igra's gents umbrellas are designed for the modern man. Alicia has put together a brilliant range of materials, frames and handles that complement each other to produce a stunning fashion accessory for any man. 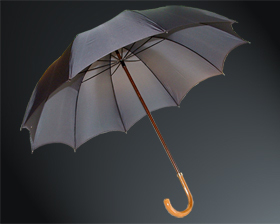 These umbrellas are sturdy and are built for every day use. 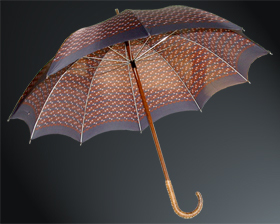 Don't settle for your black "run-of-the-mill" store bought umbrella, step out with a handsome hand-crafted unique mens umbrella from Mora-Igra. Choose from a huge range of plain or patterned fabrics, distinctive frame shapes and an unbelievable range of handles, both plain or ornately carved.